While designing your new kitchen, consider which cabinet style will compliment your family's personality and integrate the kitchen with the rest of your home. 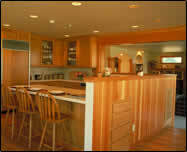 Browse through the full-color photos in our Kitchen Style Gallery and find your favorite style. A Traditional Style kitchen is always a safe choice. This classy, neutral look is easy to furnish and will never go out of style. 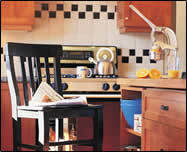 The Country Style kitchen is warm, colorful, and fun. Bright colors and casual furniture make the room cozy and inviting. 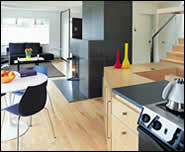 A Contemporary Style kitchen is sleek, modern and spacious. The design is clean, sophisticated and efficient. 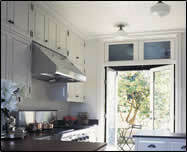 The Shaker Style kitchen is simple, pure, and uncluttered. The lines are crisp and sharp in this highly efficient, utilitarian style of kitchen.